Q: How Can I Do More Specific Google Searches? A: Whenever I need to research anything, I usually use the Google search engine, even though there are other alternatives, such as Microsoft's Bing. I like the simplicity of the Google search page (linked here). All of us have typed keywords into the search bar and then clicked through the various results to get information. However, here's a few more in-depth ways to search. 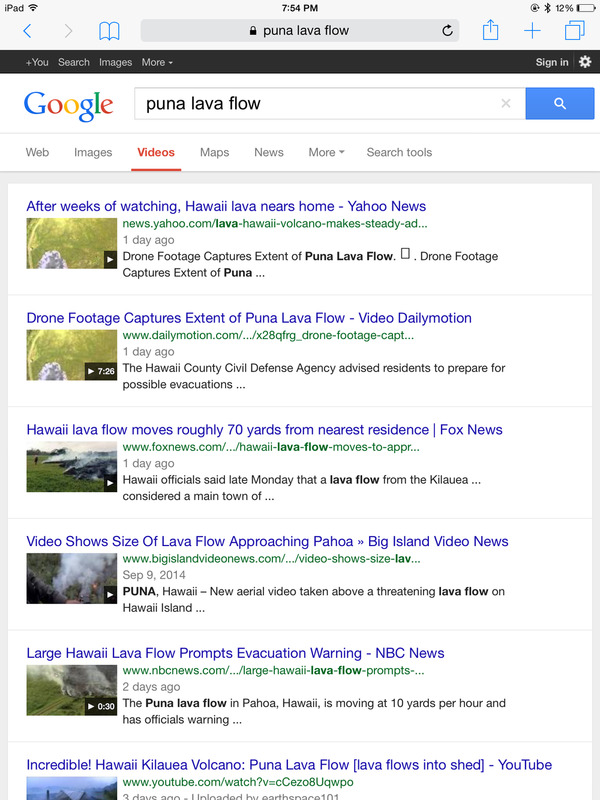 For example, if I input the search phrase "puna lava flow" in the Google search bar, I'll bet that Google will come up with a lot of resulting articles on the last big Kilauea volcano lava flow in 2008, as well as the current 2014 lava stream that is slowly advancing towards residential areas on the Big Island. If I would like to see results only for the current 2014 lava flow, I can click on the "Search Tools" menu icon on the top right of the Google search results page, and then select from the first drop down menu some additional time filters. Google will then show results for either the past "Hour", "24 Hours", "Week", "Month", "Year", or other "Custom Range" of time. This way, I'll only see the most recent web articles (e.g. for the 'past week') for my search subject., rather than from 'any (and all) time'. Secondly, Google also has an "Images" menu icon, so if I select that in lieu of the "Web" filter, my search results will give me lava images to review, rather than web articles. Similarly, if I specified "Videos" on that menu row, I can now see search results for lava flow videos from YouTube, Yahoo or Fox News, etc. If you are using a laptop or desktop computer, the Google engine allows you to search by inputting an image rather than typing in a phrase. On the top right corner of the Google search page, you'd click on the "Images" icon. As demonstrated below, your search box will now be in the Google "Image" mode, and there is a camera icon to the right of the search box. Click on that, and then select the "Upload an Image" icon. In the above example, I uploaded from my computer local drive a photo JPG file of a red Hawaiian hibiscus flower. 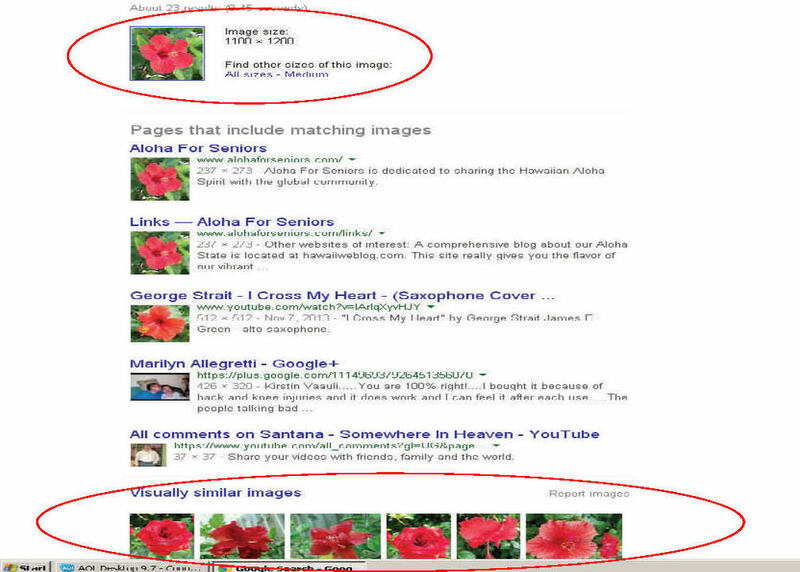 As you can see from the above screenshot, Google has taken my photo and found some web posts where we've used that picture on our website, as well as a few other websites that use a different red hibiscus. Google also shows me other similar images of the same subject. This image search feature is useful if you need to match something visually. For example, a friend of ours recently broke a coffee mug bearing a Wyland whale image, but she had a digital photo of the cup. By doing a Google image search with that photo JPG file, we could locate similar mugs on eBay. Hope that you've found these techniques interesting. Google is a robust search engine, so these methods are probably the tip of an iceberg, but it's a nice start!